If you need an interactive solution for differentiation for files or folders, or an interface-less comparison computing solution, then the component version of ECMerge is perfect for you. 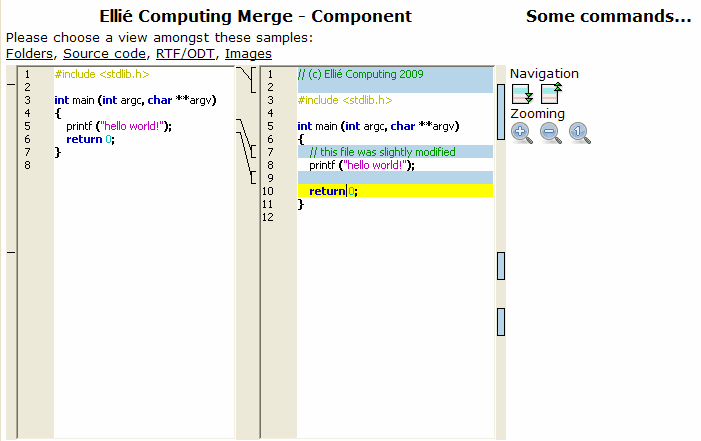 To evaluate the command line version, download the full version of ECMerge. Install it, and search for the samples directory. You will find there examples and how to use the command line. The examples are written for Windows and Unix platforms separately, they cover the same usage cases. This version exists under Windows as an ActiveX component, and as a standalone program guided by command line arguments and scripts which can produce results as text and XML. During the phase of evaluation and maintenance, you will be in direct contact with the developers of ECMerge: a responsive support of quality.